I guess I am not a typical ICFA attendee. I am not an academic, nor is my degree in anything close to literature. Nor am I a published writer of fiction. I am, I suppose, what ICFA calls an “independent scholar,” and what authors and readers call an “evil critic.” Yes, I admit it; I have written book reviews. But more importantly for the purposes of this essay, I attend a lot of conventions. 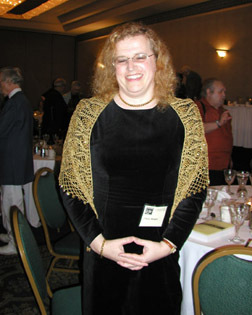 I have been involved with WorldCon at a very senior level. And ICFA is one of my favorite events. People go to conventions for many different reasons. Some go to worship at the feet of their idols (be they TV stars or writers). Some go for business. Some go to listen to wise men speak. But equally many people go to conventions to meet their friends, and many of my friends go to ICFA. In fannish parlance, ICFA is something of a “relaxacon.” Sure there is a serious academic side to it as well, and I don’t mean to belittle that, but it isn’t something that I can often be part of. The other side of ICFA is best described as “sitting in the sun by the pool and talking about books,” and I can’t imagine a better way to relax than doing that. There is, of course, a certain amount of alcohol involved as well. At ICFA I tend to consume long, cool, pastel-colored drinks that I hardly ever order elsewhere. It is my annual holiday in the sun—almost in the Caribbean—and I feel honor-bound to drink cocktails while I am there. So ICFA is a place to meet friends. For a reviewer it is particularly useful, as you can make the acquaintance of people whose books you have been reading, and come to understand them better. There is an argument that you should never review a book by someone who is a friend, but the science fiction and fantasy community is much too small for that rule ever to be enforced. I have made friends in other ways as well. In particular ICFA was the place where I met the wonderful Irma Hirsjärvi. As a consequence I have become a regular visitor to Finland and was even a Guest of Honor at Finncon. ICFA has done wonders for international relations. The academic side of ICFA is rather more challenging to me as I’m not up on all of the jargon and theory. I tend to prefer the critical panels to the paper readings, and I’m always happy to sit and listen to the likes of John Clute, Gary K. Wolfe, and Farah Mendlesohn talk. Panels at ICFA are almost always stimulating. At other conventions I get rather bored with endless discussions such as “Has the Internet destroyed fanzines?” “Are Dark Elves bad for fantasy?” and “Is there a place for religion in science fiction?” At ICFA, on the other hand, I never know what strange and interesting questions will arise. In 2008 there was a panel where the entire discussion revolved around the question of whether the word “technoculture” should be hyphenated, and it made perfect sense. Of course you have to be an ICFA sort of person to appreciate a panel like that, so I guess I must be an ICFA sort of person. As a con-runner, I find myself thinking about the organization of the convention, and actually ICFA does pretty well. It has obvious advantages. The site is generally the same (and the committee coped very well with the move from Ft. Lauderdale to Orlando), and there is continuity amongst the staff from year-to-year. In particular David Hartwell and his crew know exactly how to run their book room and can pretty much do so with their eyes closed. ICFA is also helped by its own lack of ambition. It doesn’t try to do anything dramatic, and nor does it need to. In management consulting terms it does a fine job of sticking to the knitting. The only real enemy is complacency. As long as the staff can avoid that, things should go well. There are always things that could be done better, but only rarely do I notice something that ought to be done better. Finally, of course, there is the food. 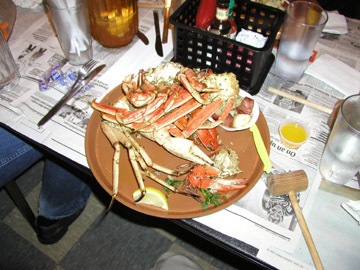 One thing I really miss now we are no longer in Ft. Lauderdale is the annual trip to the crab shack to destroy hapless crustaceans with little wooden hammers. But Orlando has many fine restaurants too, and over time I am sure that we will find plenty of entertaining destinations. Moon Fish, which I was lucky enough to go to this year, is a spectacular start. A holiday in the sun is not complete without good seafood. And besides, as fantasy readers and writers, we have to do our bit to keep the Earth safe from tentacled beings from beyond the stars. Eating their terrestrial cousins is a very good start.